Live Bookmarks combines Firefox's bookmarking functionality with the dynamic nature of RSS feeds to create auto-updating bookmark folders that list all recent entries from RSS feeds. Livemarks is a new browser extension for the Firefox web browser by Tim Nguyen that is a rewrite of Foxish, a Chrome extension that adds Firefox-like RSS and Atom handling to Google's web browser. This restores the RSS feed display functionality that Mozilla plans to remove as well. Select the "add Livemark" button at the top to create a new live bookmark for the RSS feed in Firefox. You can manage all live bookmarks that you have added to the Firefox browser with the help of the extension in the Livemark's options. There you find listed all live bookmarks and a menu icon next to each. Activate the icon to display the fields that you may edit. These are, at the time of writing: name of the feed. feed URL, Site URL, parent folder, maximum items. 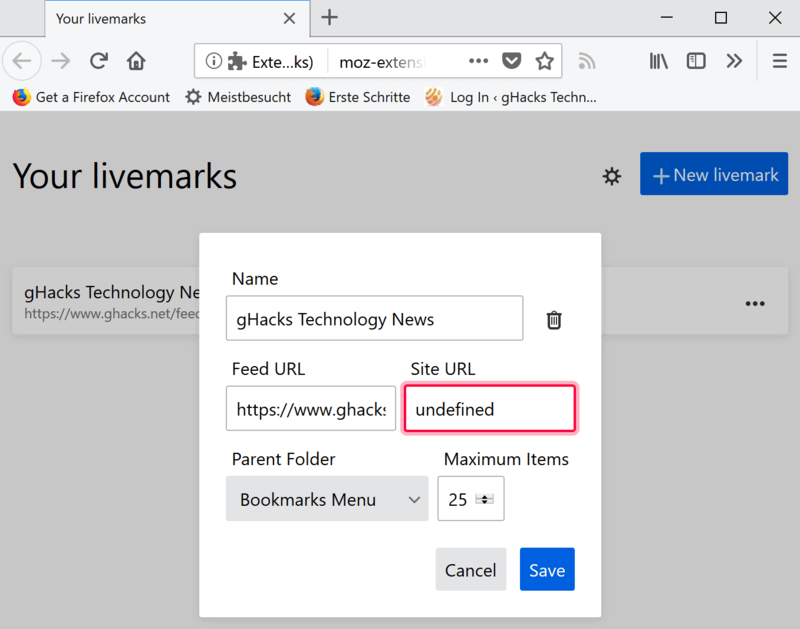 Livemarks cannot be used to import existing live bookmarks from Firefox or an OPML feed; this means that you need to add the bookmarks one by one to the extension. Livemarks restores functionality in Firefox that Mozilla plans to remove from the browser in the near future. It is useful for Firefox users who use the Live Bookmarks functionality right now, and new users who discovered it just now. So it’s a Firefox extension based on a Chrome extension designed to make Chrome more like Firefox. I couldn’t make that up. I’m not sure if i’m happy with this. Mozilla adds stupid features like pocket that should have been addons, and removes core functionality. I was half planning to leave Firefox behind, and move to another browser, but pale Moon, which i’m testing right now, thrives on old no longer supported Firefox addons. but this addon now restores basic functionality in FF. I guess this could have been expected. So no all please install this addon if you use it or not. Nice…the only thing missing is highlighting new/unread stuff but i believe the extension dev will add it soon contrary to mozilla devs who know just how to remove features. This is the only thing that is holding me back. Needs to show current item as read and there needs to me an option to mark all as read. Anyone know of one that uses the bookmark and has the ability toi make as read? Nice option restore and this will be helpful to me sometimes and probably to many in the ferry near feature it seems. Edit bookmark plus (Not working anymore in firefox quantum being 61 for me) what simple let me go thru the bookmarks folders and when I came on the specific folder that I wanted to store the link let me store the new URL. It worked almost like the star option right now from Firefox itself but the workflow of the Firefox onboard version is terrible. This because the visible space, where you can look for the specific folder, is much too small. The other option what looks (even really) great to me is working even more directly by going almost directly with one move from the bookmarks (Inbetween the history – and tools options menu) menu on to the specific folder and than store directly the new URL in the specific folder, this looks like for me personly because of then I will have enough space to overview what I am really doing even much more the most perfect workflow. So the question I have I looked over it and is there a browser WebExtension for firefox who does specifically the last or even the first bookmark savings function way? I have looked at all other right now in the web extension website but no one has that workflow or do I overlooked it? With Firefox cpu usage going up when open, surely a thing like live bookmarks will make cpu usage shoot up? Is a separate RSS feeder not a better solution? A separate RSS reader is in many cases a better option, but I don’t think CPU usage is a real concern. It only has to check the feeds every 15 minutes or so. If there’s something new, it’ll download that and parse it, but even with a lot of live bookmarks and new entries in them, that shouldn’t take more than a second. Just consider how quickly it chews through webpages. That HTML-code is generally much more complex than the XML-code that you find in RSS/Atom. @Anonymous: my question is not about loading time. I misphrased my question. What I have noticed is that if I have a lot of tabs open Firefox becomes a real memory hog and slows down. From what I understand – I have not used live bookmarks but am interested in them – is that they act like open tabs when they have downloaded new info. That would increase FF’s memory usage. 1. Mozilla abandons XUL extensions because they “could be unsafe”. 2. Mozilla keeps removing features, even basic ones from the browser core. 3. Features can be partially added by back by the user, adding more and more 3rd-party extensions to the browser. 4. Each of these extensions separately requires significant -or full- access to user data and browser activity. So obviously, this is a browser with much less features out of the box. But how is this “monster-browser” any safer than before? Isn’t this situation prone to the exact same risks, if not more? The deprecation of XUL extensions was not just about XUL extensions having almost limitless access. They were also deprecated, because they were incompatible with multi-process. It is possible to write multi-process compatible XUL extensions, but the existing extensions weren’t compatible, so severely breaking most XUL extensions was the only way to introduce multi-process. And multi-process has improved Firefox’s security a lot by allowing to sandbox webpages. Basically, beforehand you only needed a bigger vulnerability in Firefox to take control of the Firefox process and with that have the same access as the user that started the Firefox process. Now with sandboxing, you’d need such a bigger vulnerability to take control of the Firefox web process, which only really gives you access to some caches, and you’d need additionally a severe vulnerability in the underlying operating system to escalate the privileges of that process or to somehow take control of another process, in order to do some actual damage. Let me start this comment by mentioning that the shift to the new extension scheme brought enough loss of functionality that it prevents me from using Quantum as my daily driver. That said, no, the new scheme is not prone to the exact same risks. It legitimately is safer. The XUL method allows an extension to alter or snoop on pretty much everything that Firefox does. When Mozilla talks about the danger of XUL extensions, this is what they mean. The new method does not allow extensions that level of access (which is why they’re much less powerful). So it’s more difficult to write truly malicious extensions than it was before. Also, the new scheme introduces a permissions system so that you know what you’re authorizing the extension to do before you use it. I disagree. There’re still many malicious addons now. We have read many news about extensions doing malicious thing in this site. Since Mozilla followed Google’s way to not review addons, many malwares are spread in the addond site. Allowing anonymous reviews also help the malware extensions keep their rating high. More power means more risk but now in Webextension era we have much less power and still high risk. Ok, thanks. About the permissions system, you can’t really selectively allow/block permissions, right? If I remember correctly, it’s all or nothing and some extensions require permissions to stuff they don’t really need to install and work. Note that it is possible to import OPML, the settings icon on the livemarks page brings up a dialog letting you do this. I agree the icon is not super explicit though, planning to improve that. How does it compare to NewsFox? Is there anything like NewsFox that works as a webextension? I do really appreciate the fact that this exists. I used the live bookmarks feature daily. Mainly for youtube as youtube for a long time did a poor job of notifying users of their subscriptions correctly. I am sad about the fact that it does not show what links I have and have no clicked on. But if it’s the only alternative and it’s free, I have to right to complain. I just hope that feature gets added one day. Livemarks seems to work well for the majority of my former Live Bookmarks (built-in to Firefox) feeds. However, there are some sites that worked with Live Bookmarks but no longer work with Livemarks. Typically they show the icon in the address bar, but when you click on it, the popdown bubble is empty (no feeds shown). If you click on that empty bubble, it _may_ add the site _name_ to the feeds list, but there’s no actual feed. …and a few general-news sites, although there the problem _may_ be that I don’t have a paid subscription. Are other people seeing the same thing with these (or other) sites? Any workaround? why does this addon require “Access your data for all websites” and “Access browsing history” just for live bookmark functionality?